The winner of the most favourite pattern survey we conducted on Instagram, is First Touch. 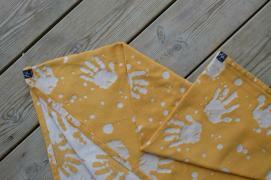 This tiny hands design was created using hand prints of our daughter Rebeka. And since all of the FT wraps were sold out – here’s something for you! A wrap, ideal for the whole babywearing period in a subtle pastel pink and grey yarn colour combination. It’s made of 100% cotton with GOTS and OEKO TEX. cl.l. Certifficate. Our FT wraps are soft right after the initial wash, they don’t require any special care or ironing and are very easy to wrap. Despite their 300g pre-wash weight, they come in medium thickness, are ideal for newborns and will be great for tiny walkers as well, when tied in layers. FT Lullaby has been weaved in limited quantity, just like all our other wraps. Few wraps of First touch Lullaby will be available on our webshop www.yakoyako.com tonight. Recommended care instructions: 40°C machine wash, using liquid detergent. Tumble dry on cotton cycle, steam ironing. 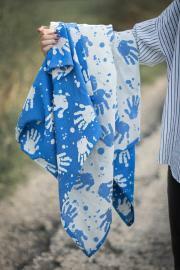 The colour permanence of our cotton wraps allow for the wrap to be machine washed with your white load. Because time flies and we need to stop for a while and enjoy all the special moments with our children..And we know, it is so easy to say and so hard to to deal with all the daily routines...But today is the International children´s day which is one of the best reasons to skip all the duties and dedicate your time to them! If you fancy pink, you are going to love this wrap..
We named it fuchsia as the pink shade is exactly the shade of fuchsia flowers. 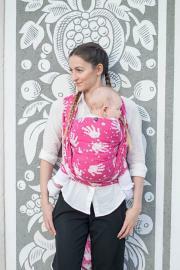 The wraps First touch in color fuchsia are woven of 100% organic cotton, GOTS certified. The wrap is middle thick on touch, but gentle and soft right after a first wash. The loom state is 300g/m2 and the wrap´s width is approx. 68Cm after wash.
Well, good things need time, right? Another wrap from the First touch collection is ready to be released. Cross your fingers to get one, they are very limited! The wraps are woven of 100% GOTS certified organic cotton yarns, produced by an european spinning mill, that also holds the Fairtrade certification. The weaving density comes from 300g/m2 to approximately 340g/m2 after washing. It is very supportive for toddlers, but becomes buttery soft for newborns after the first wash. The wrap comes with an original yako yako handmade backpack and a little booklet with the wrapping instructions. I saved this sling for a very special day - it is my 30th birthday today! Yay! Ladies, please meet another color of our first pattern "First touch" in the black&white combination. The wraps are woven of 100% GOTS certified organic cotton yarns, produced by an european spinning mill, that also holds the Fairtrade certification. The weaving weight comes from 300g/m2 to approximately 340g/m2 after washing. It is very supportive for toddlers, but becomes buttery soft for newborns after the first wash.
A je to tu, prvé šatky "First touch" čakajú na svojich milujúcich majiteľov. Táto bavlnená šatka s gramážou 300g/m2, je už pred vypraním mäkká a jemná a je vhodná aj pre tých, ktorí s viazaním a nosením len začinajú. Svojou nosnosťou a hustým tkaním zaručí príjemné nosenie po celé nosiace obdobie. Výrobca priadzí použitých na výrobu našich šatiek drží GOTS certifikát a tiež OEKO - TEX triedy I.
V prípade záujmu nás, prosím, kontaktujte správou na našej fb stránke. Testovanie prototypu prvej bavlnenej šatky so záťažou 13kg. Šatka s názvom "First touch" je vyrobená zo 100% GOTS certifikovanej bavlny s gramážou 300g/m2. We are testing our first prototype with the weight 13kg. We´ve decided to call it "The first touch" as it has a very symbolical meaning to us. This wrap was made of 100% GOTS certified cotton and it´s thickness is 300g/m2. 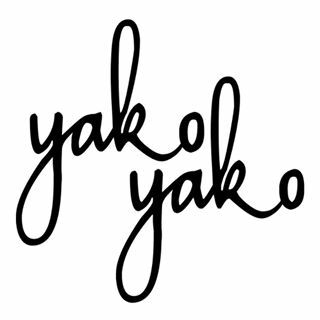 We founded the yako yako brand because we believe in babywearing and its benefits. The idea came up during our stay in Sweden where we live temporarily. It is the most inspirational country for us, but the major muse is our daughter Rebeka. She is also the author of the first design – the handprints on the wrap First touch were weaved according to her hand prints taken in her 4 months. The name “yako yako” has been derived from her first sounds or words she made while sucking a pacifier. And who are us – mother Martina, her other ME and Rebeka’s dad Daniel, his mother Anita, the absolvent of textile academy, artist and interior designer living in Sweden. Behind the graphic design of yako yako is Peter, a former graffiti artist and founder of graphic studio profigrafik.sk. He follows a motto: “Less is more and more is less”.